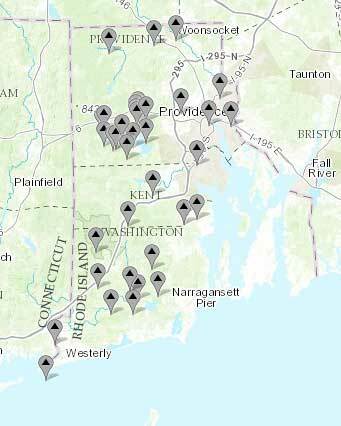 Location of all stream flow monitoring gages in Rhode Island. The Rhode Island Stream Gage Network is comprised of 35 gages and provides continuous river and stream flow data from Rhode Island’s largest rivers as well as the brooks and streams with some flow records dating back to 1909. These stream gages operate by measuring water pressure, from which the elevation of the water can be calculated and then the water elevation can be used to determine stream flow or the volume of water flowing through in a certain period of time. The Rhode Island Stream Gage Network measurements are taken every 15 minutes and the data are then transmitted via satellite to the US Geological Survey (USGS). USGS operates and maintains stream gages under contracts with the RI Department of Environmental Management (RIDEM) and other entities, including the Providence Water Supply Board that supports gages in the Scituate Reservoir watershed. 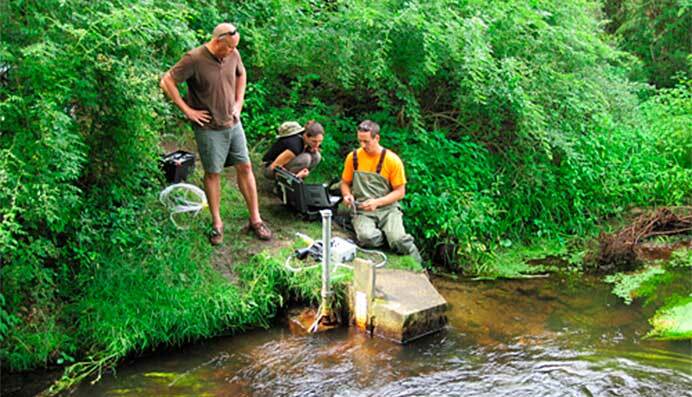 Two gages are part of the USGS National Streamflow Information Program, which, along with twenty other gages, are operated pursuant to a joint work plan between USGS, RIDEM, and the RI Water Resources Board. Data include long-term statistical analyses specific to each gage in the network, and are among the most widely used data in Rhode Island’s water monitoring programs. Annual rainfall amounts in Rhode Island have already changed drastically in the last century, and climate change is expected to further impact precipitation by producing more intense rainfall events. Climate change is projected to increase the average air temperature, and, warmer air holds more moisture than colder air. So, when warm, moist air meets cooler, drier air, the moisture condenses and may fall as precipitation—rain, sleet or snow depending on the time of year. Increases in intense rainfall events could lead to more flooding as well as unusually dry periods between the rainfall events, which could have significant impacts on stream flow and groundwater storage. USGS reports that the magnitude of stream flows during floods in Rhode Island shows a significant trend of increasing stream flow rates at most long-term stream gages. 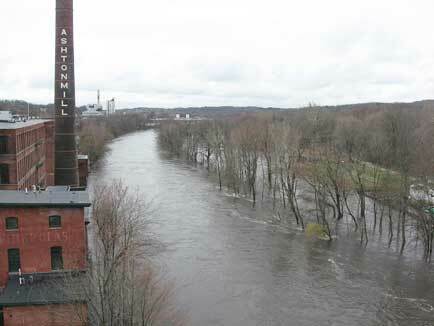 If the trend continues, Rhode Island may expect flood magnification of 21 percent by 2040. Flooding in Cumberland, Rhode Island. Photo courtesy of National Weather Service. Continued stream and river flow monitoring is essential to understand and account for the impacts of precipitation patterns altered by climate change. Increased flooding, worsening drought conditions, and reduced fresh water availability for personal and commercial use are all possible in Rhode Island’s future. Monitoring stream flow now can help residents to anticipate those changes, and provide a basis for adaptive management strategies to mitigate the negative impacts for both people and the natural environment.